On Thursday our group was in the classrooms again, and we had evening English classes at the church as well as a pizza party! 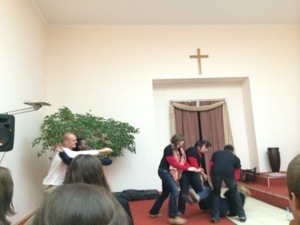 After lessons in the evening, some of the team members performed the “Everything Skit”. It was a powerful skit that many of the students were touched by, and the students told is that it made them feel a range of emotions. We also are pizza and talked to the kids about our faith, and answers questions that they had about God. 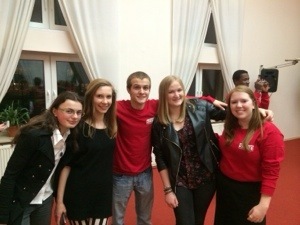 It was an amazing night of evangelism and new friendships! On Friday we went to the classrooms for the last time. Saying goodbye was difficult, but we are all so glad that we had the chance to meet these students. Most of us on the team have connected to students on social media, so we hope to stay in touch! We will finish the day by going into a city and evangelizing there. Please keep Poland in your prayers! This entry was posted in Poland 2014, Spring Break 2014. Bookmark the permalink.